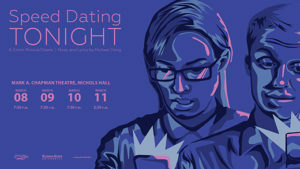 MANHATTAN — Kansas State University’s School of Music, Theatre, and Dance will present “Speed Dating Tonight” March 8-11 at the Mark A. Chapman Theatre in Nichols Hall. All performances will be at 7:30 p.m. with the exception of a 2:30 matinee on Sunday, March 11. This contemporary musical/opera is set in Joe’s Bar, where 20 lonely hearted speed-daters hope to find a sufficient other. Not everyone will find a partner, but the process leads to much humor. Tickets are $19.50 for the general public; $17.50 for seniors, military, faculty and staff; and $14 for students and youth. They can be purchased online atk-state.edu/mtd/tickets or by calling 785-236-8638. Tickets may also be purchased one hour prior to the performance in Nichols Hall. All tickets, regardless of purchase method, include sales tax and are free from convenience fees. “Speed Dating Tonight” is directed by Reginald Pittman, professor of music, director of opera and head of the voice division in the School of Music, Theatre, and Dance. Sara Flessner, sophomore in music education, Altoona, as a dater; Ashley Peery, sophomore in music education, Goddard, as a dater; Sammy Guyton, senior in music education, Great Bend, as a dater. From Greater Kansas City: Anthony Bandy, junior in applied music, Kansas City, as a dater; Kerstin Messmer, senior in theatre and French, Olathe, lighting designer; Erin Grochowsky, sophomore in music education, Overland Park, as a dater; and Michelle Stottmann, freshman in theatre and modern languages,Shawnee, assistant stage manager. Katie Knoles, master’s student in music, Independence, as Kaylee, the dating coordinator. From Manhattan: Charlotte Benjamin, junior in theatre and music, as the waitress; Emma Galitzer, junior in theatre and French, stage manager; Paul Hunt, professor of trombone, as a dater; Alex Kinsinger, junior in theatre, Manhattan, assistant lighting designer; Heather McCornack, master’s student in music, as a dater; and Willie Michaels, junior in applied music, as a dater. Quinton Church, graduate student in music, Minneapolis, as the bartender; J.D. Warren, sophomore in theatre, Salina, as a dater; Breana Tiffany, freshman in theatre, Topeka, choreographer; and Madison Boyer, senior in applied music, as a dater, and Spencer McIntire, senior in applied music, as a dater, both from Wichita. Shiana Tyler, a senior in theatre, Phenix City, Alabama, props master; Holden Brown, sophomore in business administration and theatre, Peoria, Illinois, assistant props master; Samantha Williams, sophomore in applied music and French, Branson, Missouri, as a dater; Mitchell Jerko, master’s student in music, St. Marys, Pennsylvania, as a dater; Grace Volker, junior in applied music, Madison, South Dakota, as a dater; Sam Wilson, senior in applied music, Fort Worth, Texas, as a dater; and Julia Deeb, junior in biology and applied music, Schertz, Texas, as the bus girl. From out of country: Shuhua “Abby” Zheng, master’s student in music, China, as a dater; and Tayo Hamzat, master’s student in theatre, Nigeria, scene shop graduate assistant.